BAKKO Slimline Series - 8' x 12' [1-BKB2703-12] - $2,580.00 : Signature Tennis, Your source for Country Club quality products and services for all your tennis court needs. 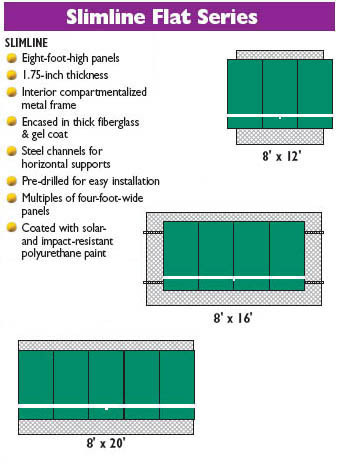 Panels are 1 3/4" thick with correspondingly less interior framework and thickness of sound deadening material. Each panel is otherwise manufactured similarly to 10' high professional lines. Panels are pre-drilled so green face bolts attach each panel to metal channel. 8' backboards are usually suspended a foot off the ground. This backboard is not as quiet or pleasing as the 10' high professional series but an excellent, durable practical product, and a good seller. Typically purchased by schools, universities and parks. Most common purchases are 3 and 5 panels. Eight foot high panels. 1.75 inch thickness. Interior compartmentalized metal frame. Encased in think fiberglass & gel coat. Steel channels for horizontal supports. Pre-drilled holes for easy installation. Multiples of four foot wide panels. Coated with solar and impact resistant polyurethane paint.